Contrary to common belief, Neanderthals did not live deep inside caves but at their entrance, under rock shelters. 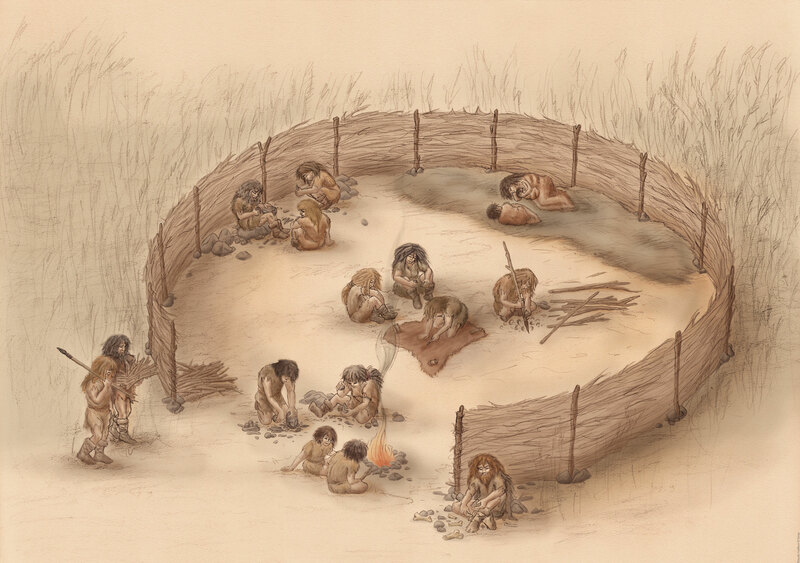 They possessed the necessary know-how to build temporary shelters, which were used during their seasonal travels to follow game, to harvest plants and vegetables or to stock up with flint. “La Folie” a site, located north of Poitiers, provides exceptional evidence of a base camp in a circular wind shelter. Examples of outdoor constructions are rare since the materials (wood, plants, skins…) used to build huts, tents or cabins did not last long. The “La Folie” campsite was partially reconstructed for the exhibition to 1:1 scale (10-metre diameter). The floor is crisscrossed like an excavation site, indicating the different areas of activity: a carving station, a leather-working area, a living space and a bedding area. Two floor showcases display the lithic objects which were found in these specific spots, as well as the attachment system used for fixing the wooden pole palisade to the ground. A mural represents the site in elevation, and the figures of its occupants pursuing their various activities. Speculative reconstruction of “ La Folie”, 2009. Pencil and graphite on paper, Photoshop colourisation. © Inrap. The excavation at the “La Folie” site in Poitiers has enabled the reconstruction of this habitat that was protected by a windbreak and where Neanderthals carried out their daily activities: flint knapping, meal preparation, the processing of animal and plant resources and… resting (approximately 60,000 BC) (Excavation undertaken by Laurence Bourguignon, Inrap). In order to survive, Neanderthals exploited all resources: fauna, flora and minerals. They went picking, harvesting, fishing, hunting and they sometimes scavenged carrion. The effectiveness of Neanderthal subsistence behaviour patterns implies a good understanding of the raw materials available and a good toolkit to use them - either raw or processed. Lithic objects, screenings and illustrations retrace the daily lives of Neanderthals. A diorama of the ”Romani” rock shelter in Spain and the model of a hut built with mammoth bones, located in Molodova, Ukraine, evoke other Neanderthal housing structures. Scrapers, bifaces or hand axes, lithic flakes, stone spearheards and blades; bone lissoirs and pressure tools… can all be found at Neanderthal sites. The majority are old tools that had been thrown away. A showcase displays 11 tools, originating from the “La Folie” site, which make up the perfect Neanderthal pouch. In it, they carried around all that they needed in their daily lives: a reserve of raw materials, several fresh, sharp lithic flakes; 2 or 3 scrapers to cut up meat or carve wood, lissoirs for leatherworking, and pressure tools for sharpening. These tools indicate Neanderthals’ command of hard rock knapping or chipping, using striking techniques, and their ability to crafttools suited to their various activities. 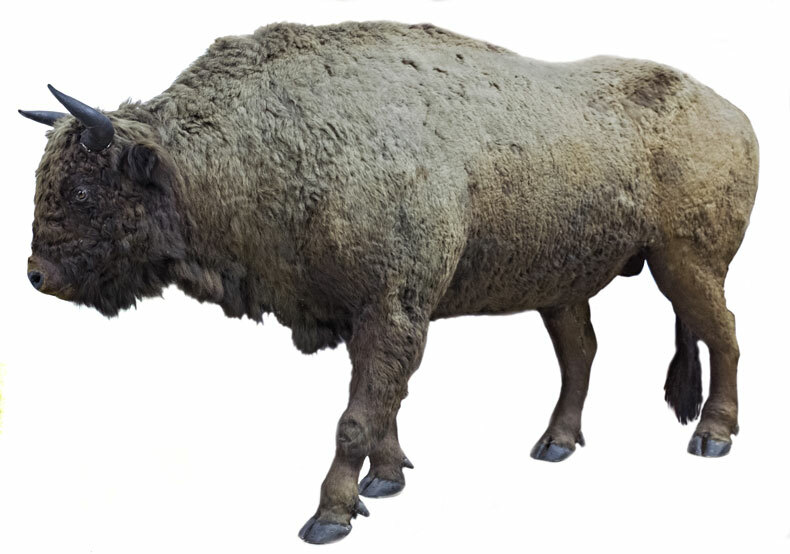 In all climates and latitudes, Neanderthals hunted bison, horses, reindeer, ibexes, chamois and, in regions further east, mammoths and saiga antelopes… They also hunted carnivores such as foxes, wolves and bears for fur, as well as small game animals (hares, birds…). While there are many traces of hunting and carcass butchering, it is likely that Neanderthals also scavenged the carcasses of animals that were difficult to kill (mammoths, rhinoceroses) and ate marine animals washed up along shores (seals, dolphins). A film made from docu-fiction footage recreates scenes of bison hunting and butchering as well as fishing scenes. Hunting requires weapons: wooden spears, bolas, knifes, stone-tipped spears. With these rudimentary arms, strategies were needed to get closer to game, in order to identify their habits and anatomy, and the most convenient places to capture them. An analysis of the traces remaining on Neanderthal tools bears witness to the “operational chain” involved in the processing of game. Not only were the meat, fat, skin and bones retrieved, but the ligaments and nerves were used as rope. Big meat eaters (as demonstrated through the analysis of the animal bone remains found at archaeological sites), Neanderthals fed on the flesh and fat of large herbivorous animals: mainly horses, bison, reindeer… The methods for analysing bone collagen and dental tartar microparticles have enabled scientists to more accurately reconstruct the Neanderthal menu. Much more varied than previously thought, their diet also included wild - raw or cooked - plants, fruits, freshwater fish, and shellfish.